Matchbook Learning is building an innovative system of badges (also known as "microcredentials") to support our educators and school staffs to gain validated recognition for the skills and competencies they learn throughout their careers. The system allows educators to submit evidence, have it reviewed by experts and peers, and earn digital certification of specific competencies. Badge-based certification is a rapid method to gain professional experience and prove your ability level — both internally and externally — raising the bar and quality of work for the entire organization. Badge stacks (or collections of skills) can be earned across professional domains or deeper into one specific area of expertise. 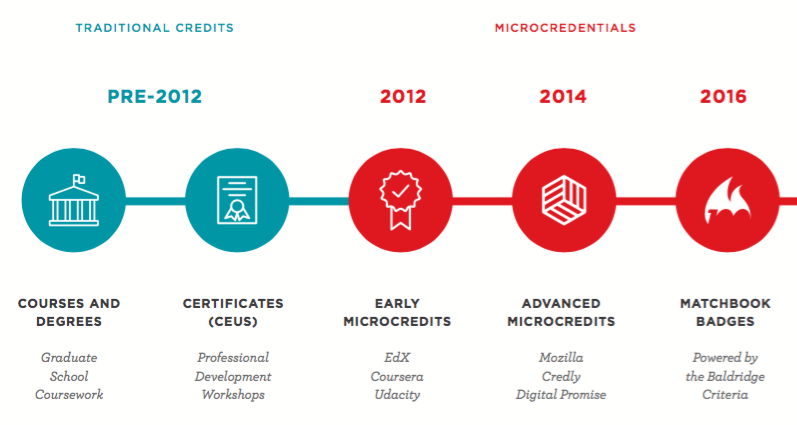 Accreditation for employees in the education industry has dramatically changed over the past decade with the introduction of Continuing Education Units (CEUs) and microcredits introduced prior to 2012. 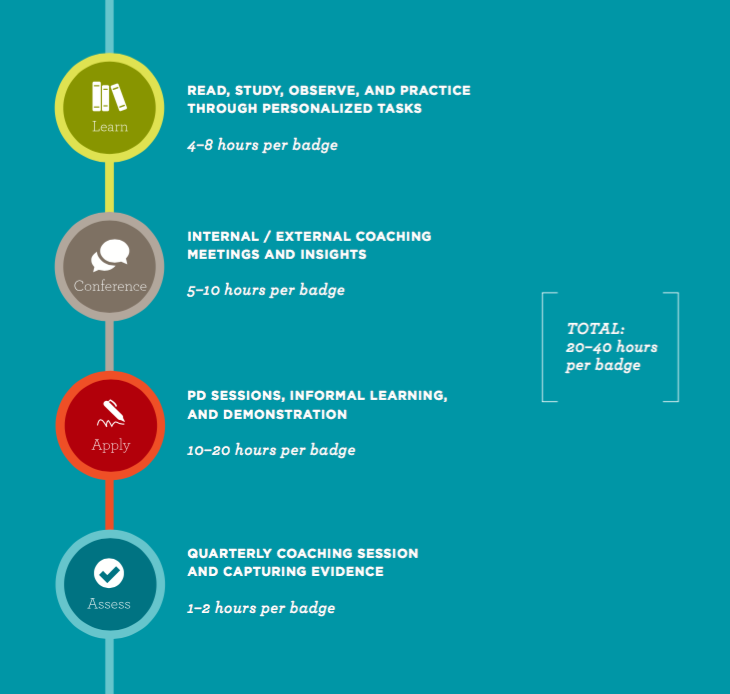 Matchbook Learning aims to break new ground with a deeper series of badges anchored by the Baldrige Criteria for Badges and what we've learned over the past few years in the industry, as evidenced by the diagram below. What is the Baldrige Criteria? 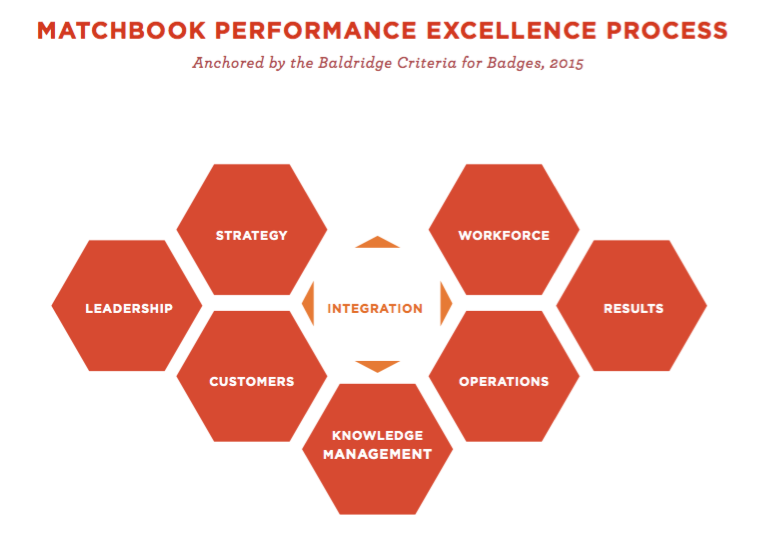 The Baldrige Program provides the foundation for Matchbook Learning's Performance Excellence Process. Their internationally-recognized framework offers criteria, assessments, tools, training, and a community for those dedicated to helping organizations improve towards world-class status. In a Matchbook School, every student starts each subject not at their age or grade level, but at their unique competency level for that subject which could mean they are ahead, behind or at their grade level when they start. 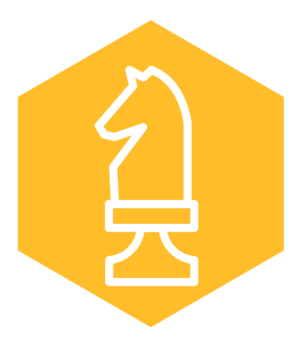 Similarly, each Matchbook teacher acquires their badges on a personalized pathway based on the proven methodology of the student GPS Board model. We describe this personalized pathway using our “GPS Board” similar to how a car or smartphone’s GPS system navigates you to where you want to go from wherever you are, step by step. Our GPS system has four navigation steps in a student’s continual but personalized learning pathway. These steps help inform our philosophy of learning. Learn about our model. Matchbook badges will be an integrated part of existing professional development work for all employees. Most badges will be earned over 90 day cycles through a combination of independent work and multiple touchpoints with coaches. The system is designed to adapt to individuals with opportunities to accelerate how many badges you can earn in one year. 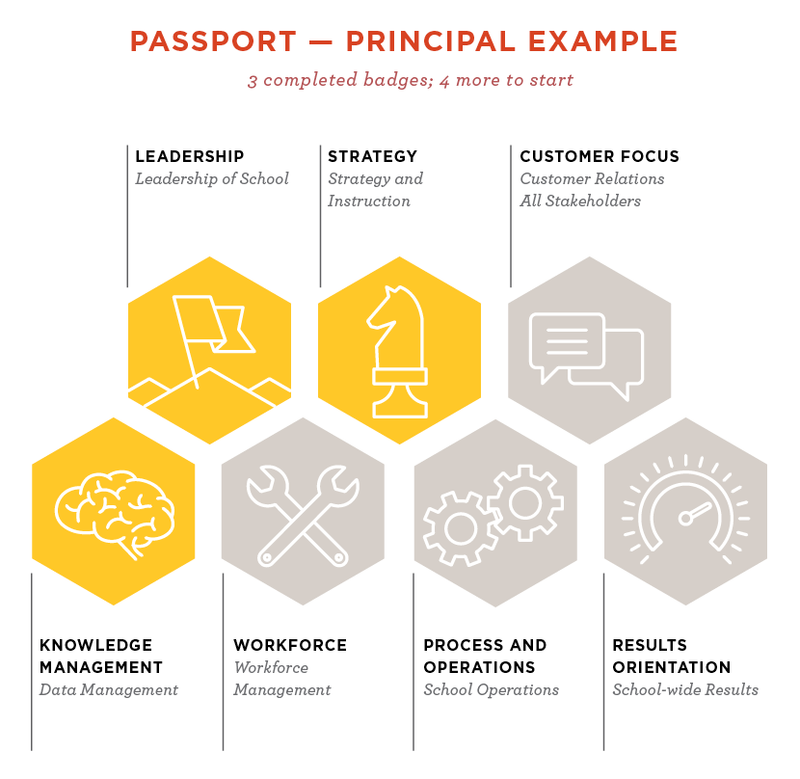 Every Matchbook Learning employee will have their own Badges Passport that shows all completed badges, potential future badges to earn, and any badges currently in progress. This at-a-glance illustration allows each individual and their coach to see where they stand in the Matchbook Performance Excellence Process. The following examples are excerpts from the entire suite of Matchbook Learning microcredentials. These are intended to be a preview into the Matchbook Performance Excellence Process where employees and coaches work together to earn professional skills throughout the school year. To learn more about badges, contact Sajan George.